My wife was shopping at Jo-Ann‘s Fabrics this afternoon, which meant I was across the street with a cup of coffee and my Nook ereader. 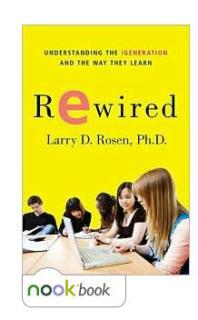 I have just started Larry Rosen’s 2010 book Rewired: Understanding the iGeneration and the Way They Learn. So far, I am only up through Chapter 2, but I came across an interesting quote in Larry’s book that made me reflect on this past week in our GRAD 602 course. Jeff Nugent and I are co-teaching this course, Teaching, Learning and Technology in Higher Education – part of VCU‘s Preparing Future Faculty program. We have 24 bright doctoral students / post-docs in the course. 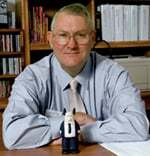 In his book, Larry examines the way generations approach technology, from Baby Boomers like me through Gen Xers (my daughter gags at that term – “What? Named after a letter in the alphabet?”), then NetGen or Millennials, born in the 80s and early 90s, to the latest generation – the iGeneration. 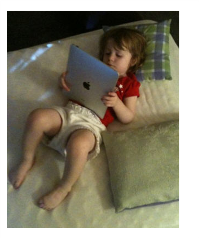 The newest kids on the block have lots of technologies with “i” in them – iPod, iTunes, Wii, iPhones, and of course, my granddaughter’s favorite, the iPad, as shown below. “My younger brother, Aiden, is only 7 and already he is doing techie stuff that I haven’t even tried. And he picks it up so fast. He was on the web when he was 3 and already has a cell phone and knows how to text me. I can’t imagine what he will be doing when he is my age. On Thursday night, Jeff introduced Twitter to our class. None previously had accounts in Twitter, and in fact, many had stated they had no intention to start. When Jeff told them that exploring Twitter was a component of this class and that they would all have to set up accounts, there was a collective groan from the room. Some of their initial reactions can be found here and here and here. Jeff and I have been introducing our students to various web technology tools over the past five weeks. As Jeff noted in “No guarantees…“, we have used the 7 Principles of Good Practice as a lens to examine whether to adopt a particular technology or not. So far, these technologies have included blogging, social bookmarking with Delicious and Diigo, RSS feeds and aggregation, and last Thursday, Twitter. I think I can safely say that our students do not feel that technology is the center of their universes…though thanks to Jeff and I, they may feel consumed by it! Yet, these future faculty will be facing (live or virtually) students from this iGeneration in not too many years as they teach in higher education. Larry’s research found that 16-18 year-olds now spend on average around 2.5 hours a day online, not counting the other media with which they are engaged simultaneously. They are texting on average around 3.5 hours a day. Nearly half of all high school students have their own computer in their bedroom. If one assumes that communication is a key element of their lives, then what does that mean for our future faculty? How connected will they be with their students? What will be the expectations of these faculty and how will those expectations mesh with those of their students? I really do not know, but I see the future as both exciting and a little scary. Jeff and I both gave our cell phone numbers to our students, yet in six weeks, I have not received one text message from any of them. Will that be true of their future? If technology is sorta like the sky, what will that mean for teaching and learning? As always, if you have thoughts on any of these questions. I would like to extend the conversation. NextNext post: Happy Pi Day! This sounds like an interesting book. When you are done reading, would you be willing to lend it to me for my nook? Be happy to, Kelly. Just have to remember to bring my Nook in to work on Thursdays. Would Ashley say that she’s consume with and by the sky? No, I think she would say that the sky is just there. It’s part of her environment, and there’s an assumption that it will always be around. I’m guessing that’s what she meant by saying technology is like the sky. It’s just there. It’s part of her environment, and there’s an assumption that it will always be around. What will a student like Ashley think when she walks into a college classroom where there’s no technology in use? Would it be a bit like waking up one morning and looking out the window to find out the sky isn’t there anymore? A better question, Derek. I am reminded of an 18 year old a few years back in a focus group I was running who equated access to the internet with oxygen – both necessary for life. Students like this might be gasping as they enter classrooms with no technology in use!